A kitchen is the “heart of the home” due to the versatility and the frequency the area is used. 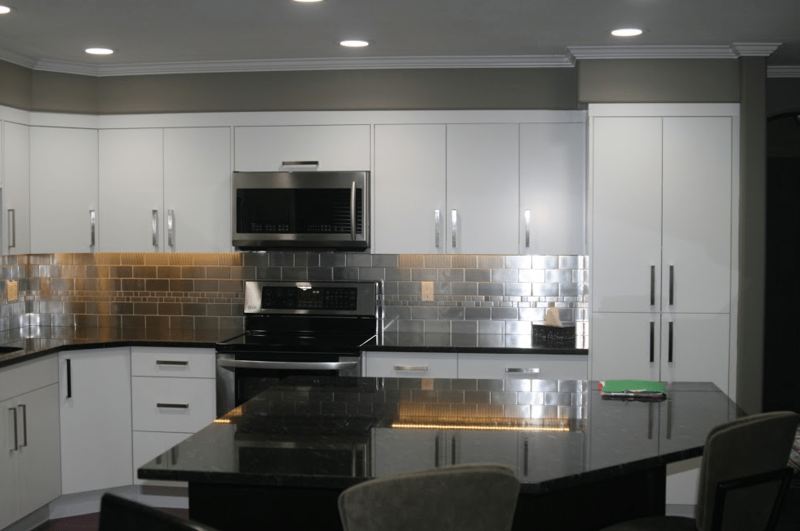 Having a functional and aesthetic kitchen design sets the appearance and style of the entire home. Kitchen spaces are multi-functional and are commonly used both by guests and residents for eating, cooking, and entertaining. People are usually drawn to the kitchen more than any other room in the home. Having a kitchen space that is clean, visually pleasing, and highly functional can help promote a better overall atmosphere in the home. A custom kitchen makes cooking more efficient and enjoyable, as well as make entertaining easier and more natural. A kitchen renovation is one of the most valuable renovation projects a homeowner can undergo, greatly improving the resale value of a home. 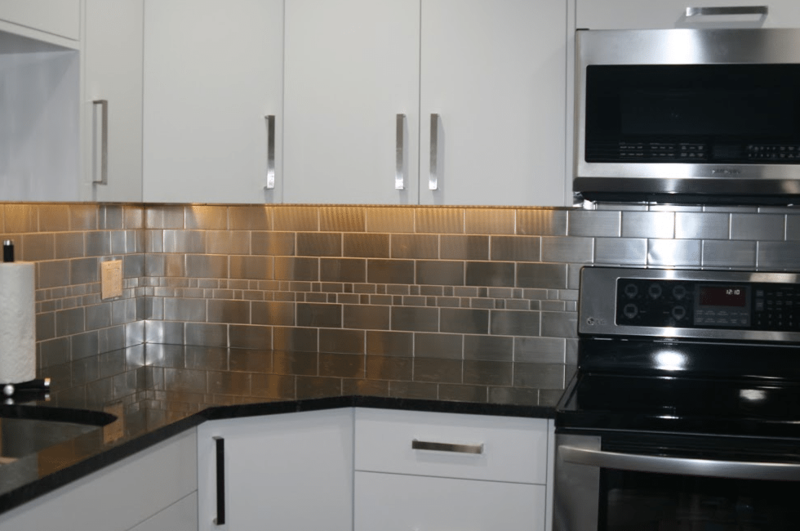 There are so many reasons to renovate a kitchen space, to increase property value, improve the look and comfort of a home, improve the use and functionality. 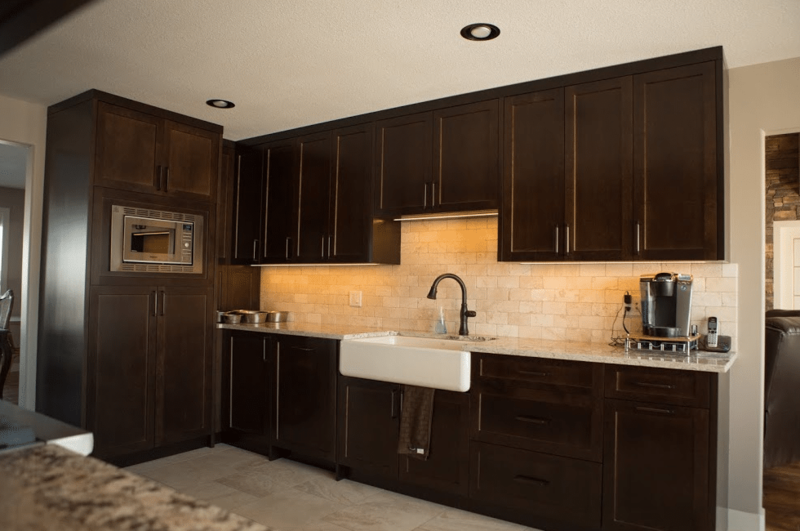 At Golden Acre Renovations, we can help with each step of your kitchen renovation in Calgary including the design, planning, construction, and cabinetry/appliance installation. Contact us today if you have any questions regarding your kitchen renovation project or if you’d like to book a consultation. More Space – Older kitchen spaces can feel bulky and cluttered. A kitchen renovation can add valuable space and a natural flow to your current kitchen space. Easier Home Cooking – With improved appliances and a new kitchen layout, your home kitchen can feel much more attractive and inviting for home cooking and eating. This can save you money on takeout and restaurants. 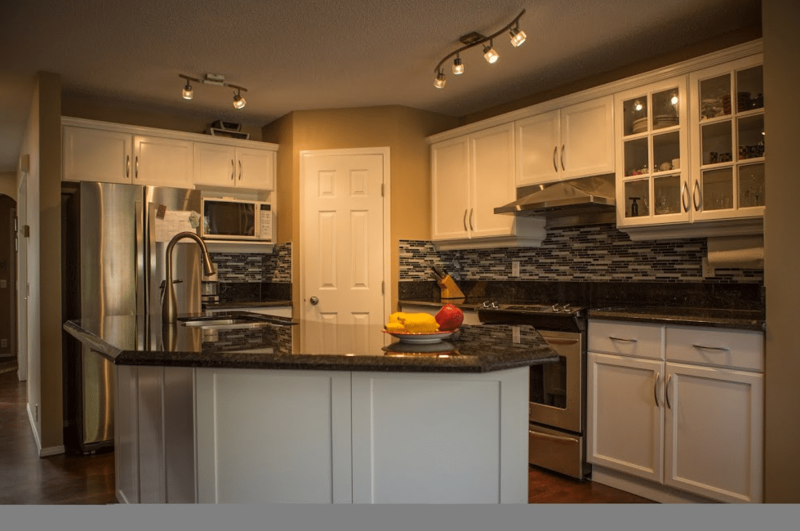 Resale Value – Improving your kitchen space increases the value of your home when it is time to sell, making it more appealing to prospective buyers. Upgraded Appliances – New appliances can make cooking more fun and efficient, while making your home safer and “greener”. 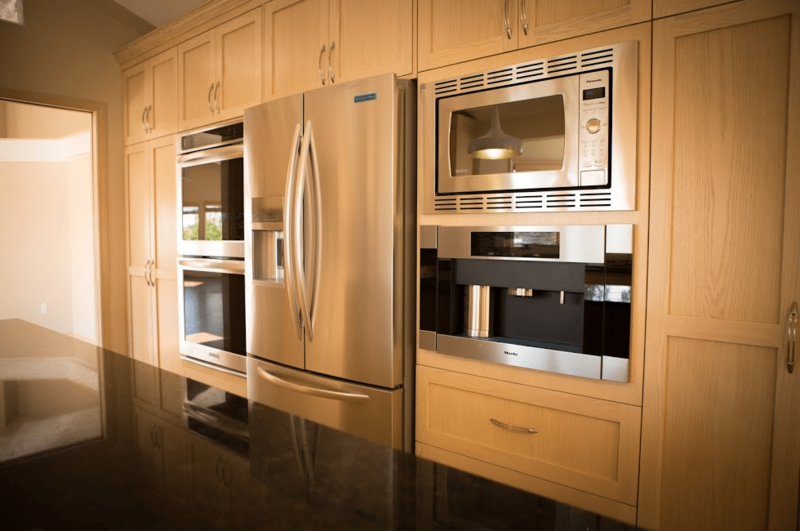 New and matching appliances can also add a more consistent and upscale look and feel. Backsplashes – Backsplashes can add a burst of colour, a unique texture or an artistic addition incorporated with your stove’s hood vent. 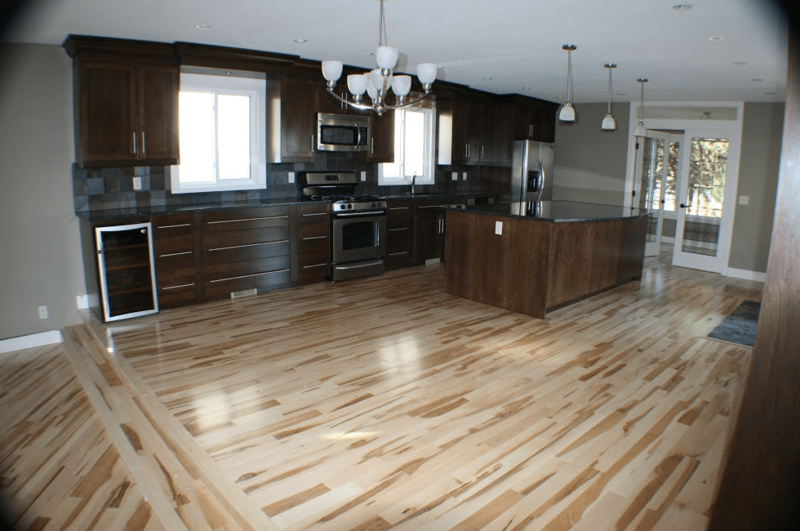 Flooring – The flooring can be made from several materials and colours, and can be installed with custom finishings and transitions to create a unique design. 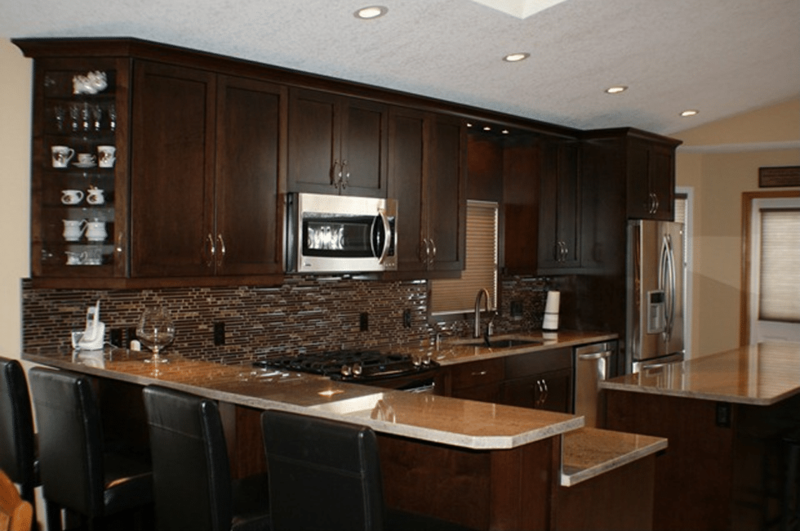 Cabinets – Cabinets are a key element in kitchen design and function. Cabinetry can often be the first thing individuals notice when they enter a kitchen and set the design and feel of the kitchen. Countertops – Metallic, granite, marble, stained wood, and other materials can be used as kitchen countertops. Paint Colour & Texture – The overarching colour and feel of the space can be defined by paint. Paint can compliment wood stains and can add a balance of colour in a mainly white space. 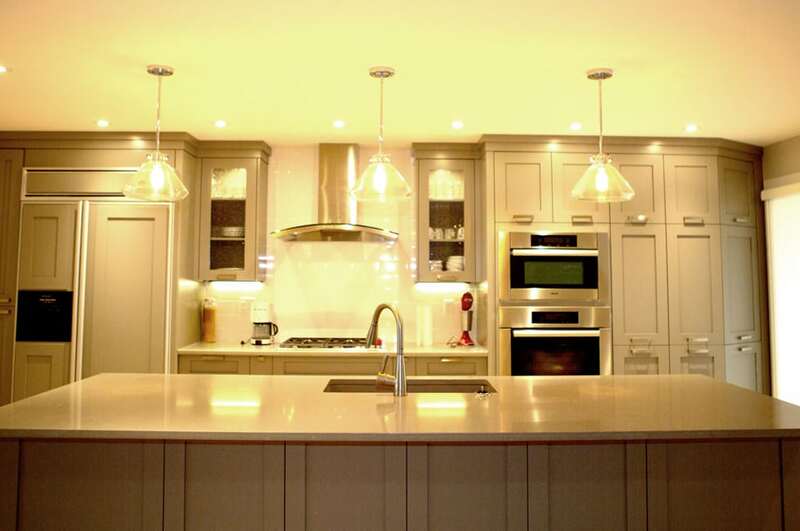 Lighting – There are numerous lighting options available for kitchen lighting. 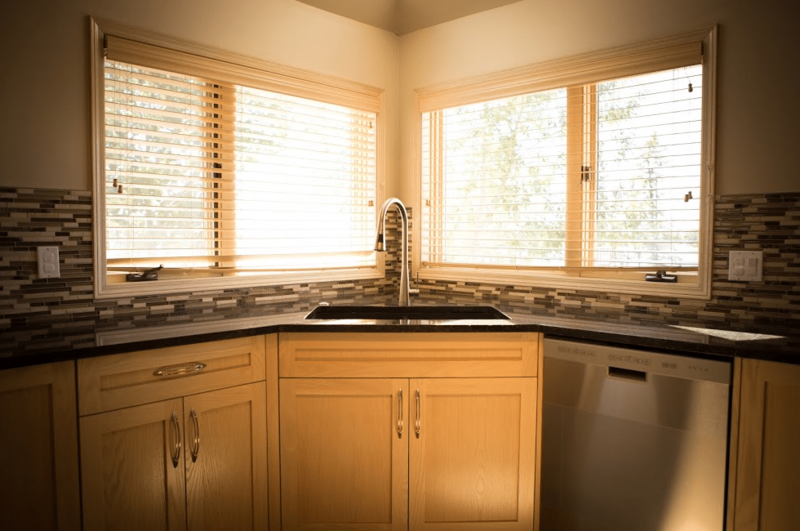 Natural light from large windows, LED lighting inside of cabinets, accent lighting, and custom lighting fixtures can all be installed to better illuminate a kitchen. Contemporary Kitchens – The kitchen style of the 21st century. Contemporary kitchens blend elements of new and old to create a balanced kitchen design that is trendy and modern in look and feel. Contemporary kitchens use innovative appliances, a well-defined work triangle, open concept, and flat panel cabinets, while allowing for lots of room for seating and entertaining guests. 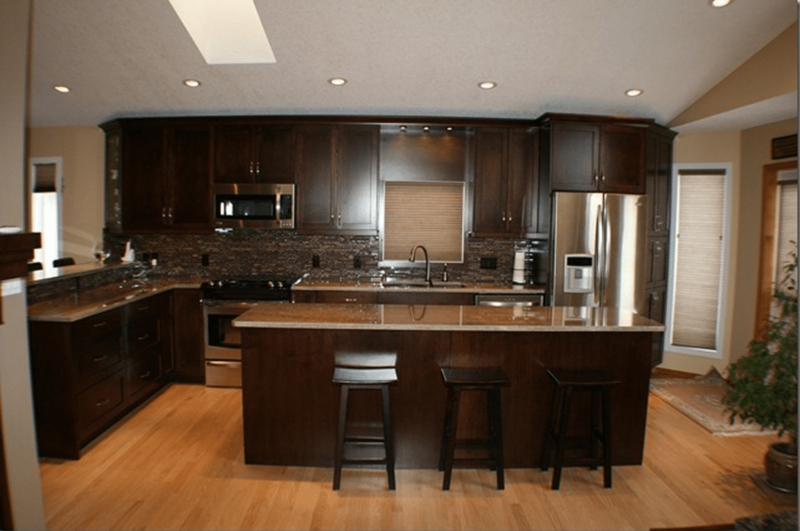 Modern Kitchens – Modern kitchen renovations create sleek and efficient kitchens that have flat and geometric designs. A modern kitchen often has flat-paneled cabinetry, horizontal lines and reflective or polished surfaces with metallic accents. These spaces forgo detailed designs and fabrics to maintain a highly modern and clean look. Rustic Kitchens – Perfect for country living, a rustic kitchen design aims to resemble a western feel that is common in rural properties and farmhouses. These spaces have a range of wooden elements and old-world accents to create a relaxed and “outdoorsy” atmosphere. French-Country Kitchens – These kitchens are glamorous and highly detailed. Timeworn surfaces, made from detailed and/or distressed wood and upscale metallic finishes are common aspects of country kitchens. French-country kitchens resemble a look and feel similar to a villa in the Southern areas of France. 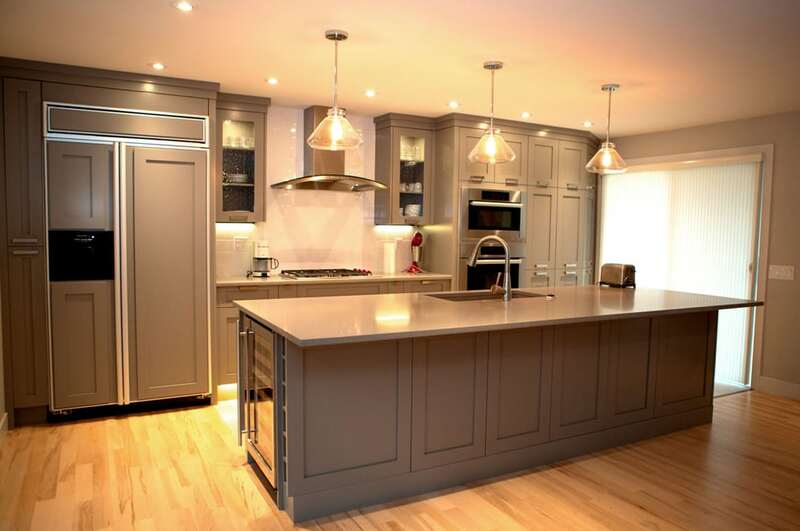 Traditional Kitchens – Traditional kitchen renovations create classic kitchen designs that are both clean and comfortable. Wooden or glass-paneled cabinets, custom woodwork, an emphasis on white, and vintage lighting fixtures commonly build-up this design. 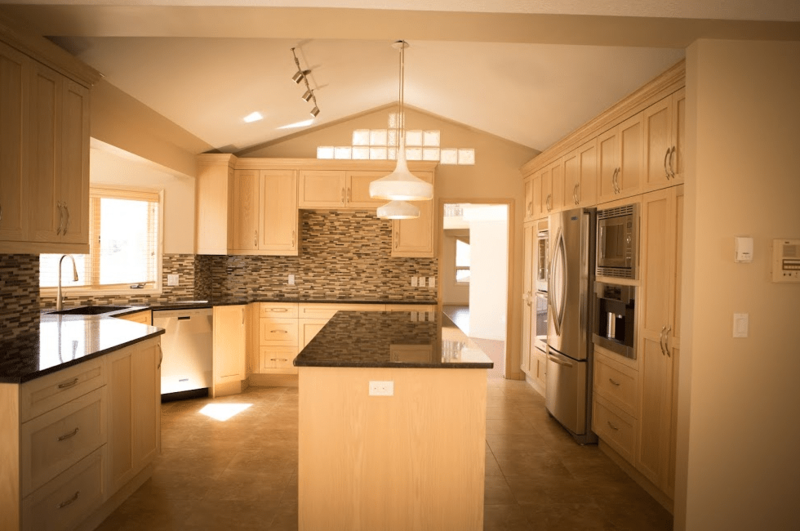 The terms “renovation” and “remodel” are often used interchangeably. Though, the meanings of each term are not the same thing. 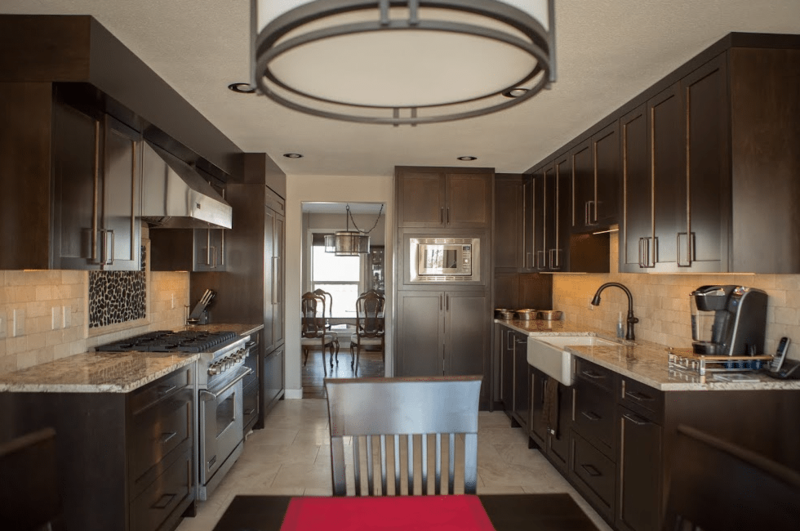 A kitchen renovation aims to revitalize a kitchen space through material and appliance upgrades. A kitchen remodel alters the size and/or layout of the existing space to offer a new flow and more personalised look and feel to the kitchen. 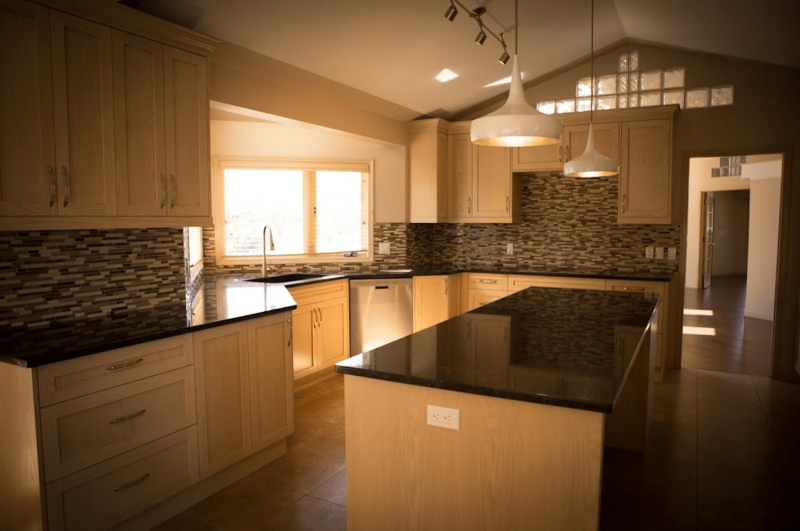 If your current kitchen layout is the main reason you want to have work done, a kitchen remodeling service will better suit your home improvement needs. 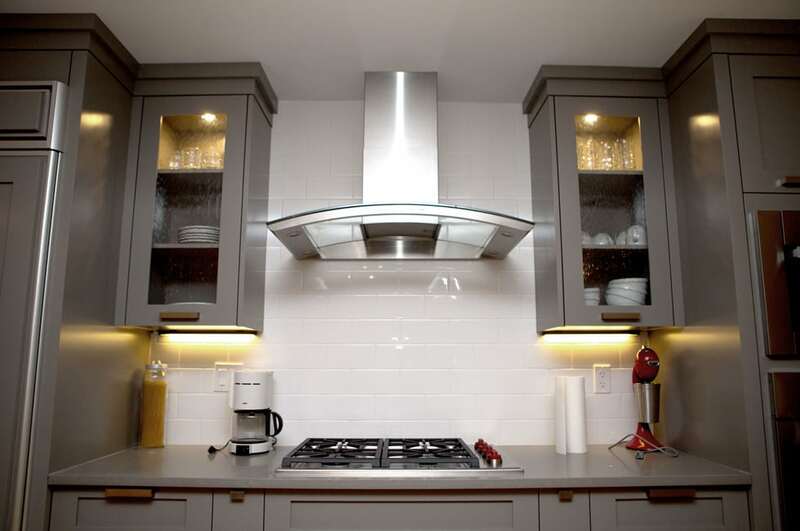 Your kitchen cabinetry is a key part of the design and function of your kitchen. Cabinets can be made with a range of flat or raised panels, using a variety of styles and materials. 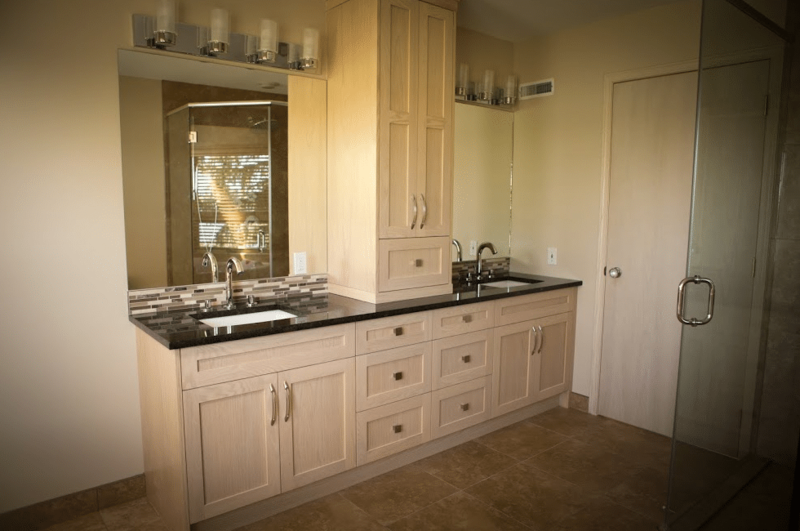 Cabinets can be made frameless and overhang or can offer exposed hinges in a framed-design. Cabinets can be made with shelving or drawers while being crafted using a variety of materials, colours, stains, and closing mechanisms. 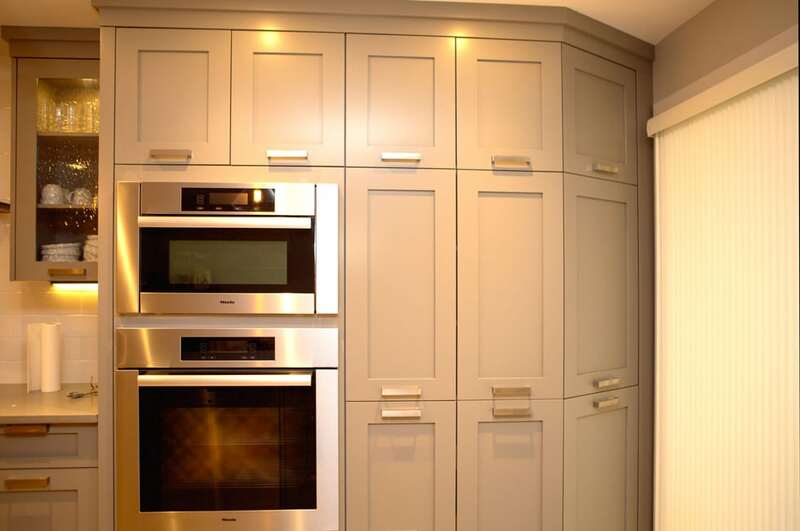 Cabinets improve the function and storage of a kitchen, where these storage options can be used inside the cabinet and on the backside of cabinet doors to increase the capacity and organizational capabilities of the home’s kitchen. 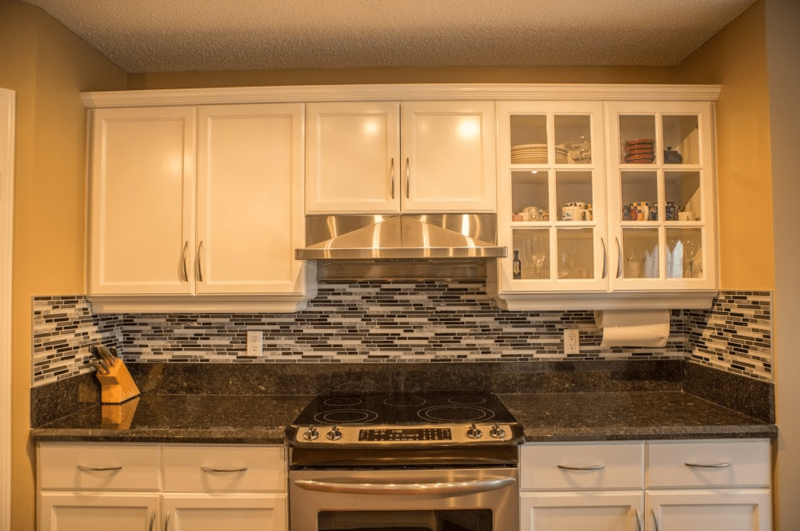 Renovating your kitchen often involves the replacement or refinishing of cabinets; these are considered kitchen cabinet renovations and are a key component of any kitchen renovation project. Your countertops can provide increased space for food preparation or for serving guests. Kitchen countertops can be made from several different materials. 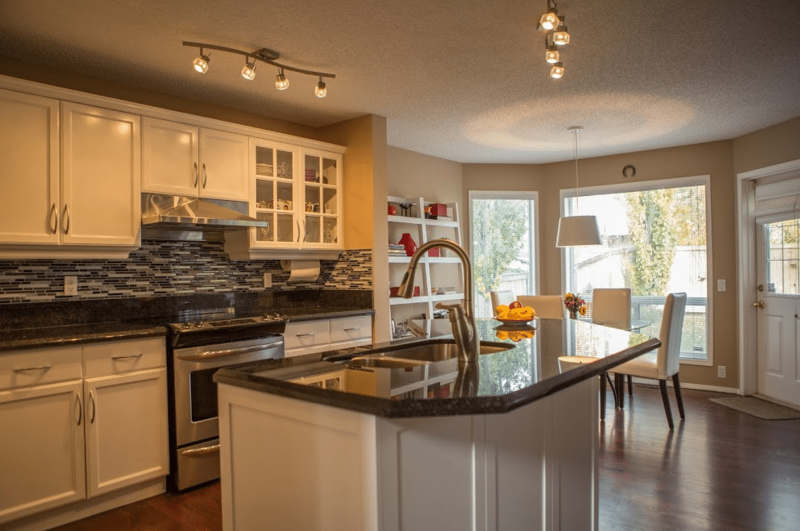 These are 5 popular custom countertop materials found in Calgary kitchens. 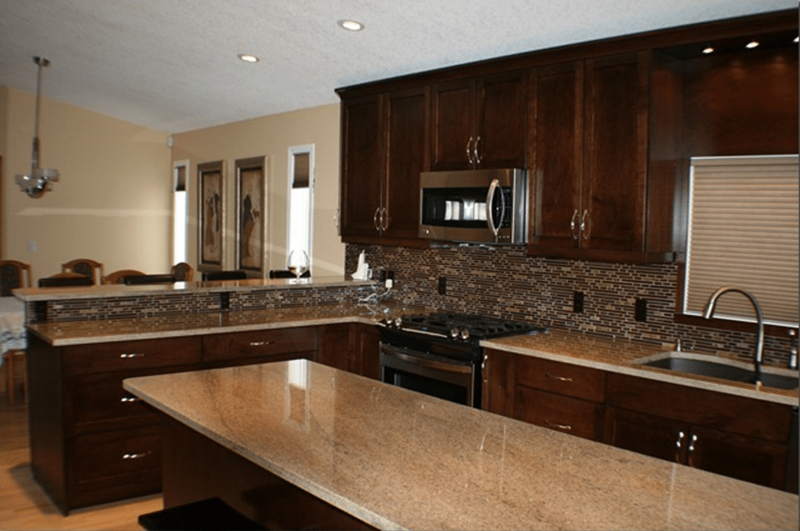 Granite Countertops – Granite can offer an elegant appeal and is quite durable. Granite is a classically upscale and natural rock that is perfect for luxurious and traditional kitchens. Marble Countertops – Marble offers a base tone, coupled with distinct veining that works together to offer natural and unique aesthetics. Quartz Countertops – Unlike granite and marble, quartz is a man-made stone that offers a similar look to natural stones, while providing a more durable finished countertop. Laminate Countertops – These are often the most affordable option for kitchen countertops. Though, this material cannot offer the same durability from impact or heat that a stone or metal-based countertop can. If customization and affordability are your goals, then a laminate countertop is a great option. Butcher Block Countertops – Butcher-block countertops help create a warm and inviting atmosphere. Though, they can require annual maintenance with sealing and oil application to avoid water damage and staining on the natural wood. These can be ideal as a section of a countertop that utilizes stone, metal or laminate as the main material. For more information about us and our services, please visit our contact page. Ask Us Your Renovation Questions! 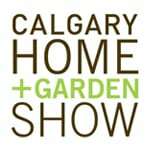 Send us an email regarding your renovation ideas or questions, and we will get back to you as soon as possible!